governance crisis and allegations of undue influence in awarding contracts, is struggling to remain solvent and maintain liquidity, despite having received a 400% price increase in the past ten years. Where Eskom as recently as 2015 could not produce enough electricity to meet the demands of the industrial, commercial and residential sectors, the country now has excess capacity and electricity demand has declined. Eskom has not seen any electricity consumption growth in more than a decade, while, at the same time, the national power utility has embarked on a large, coal-fired power station expansion programme for which it has had to borrow significant amounts. 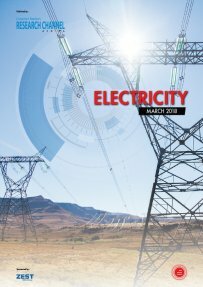 Creamer Media’s Electricity 2018 Report gives an overview of South Africa’s electricity sector, with a focus on Eskom’s capacity expansion projects, financial position, governance failures and corruption allegations. It also looks at the role of independent power producers, which have attracted significant foreign investment into South Africa. The report also examines energy storage, which is increasingly becoming a reality; energy efficiency and embedded generation; as well as other areas such as transmission and distribution and electrification. This report draws from material published over the past 12 months and is a summary of information published in Engineering News and Mining Weekly, as well as of information available in the public domain. This report does not purport to provide an analysis of market trends. Published on: 14 March 2018.